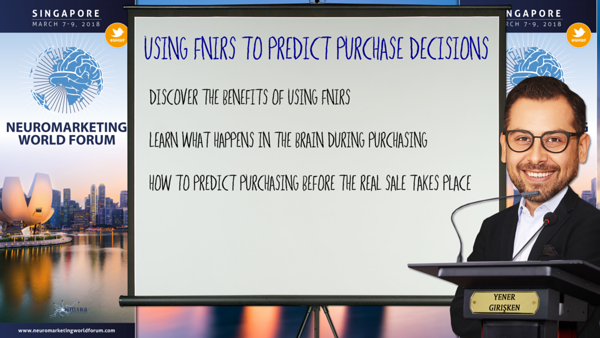 The decision-making mechanism in the brain during purchasing has been one of the most interesting subjects within the realms of neuroeconomics and neuromarketing. To shed some light on how underlying brain mechanisms respond to purchasing behavior, a functional near-infrared spectroscopy (fNIRS) device was used to collect accurate measurements of the frontal cortex. This study revealed robust results when it came to predicting purchasing behavior. A technique that gives a first step towards the future of marketing research, with a deeper understanding about the decision-making mechanism in the brain. Dr. Yener Girişken will discuss how his study explored the role that the pre-frontal cortex plays when making purchasing decisions by utilizing fNIRS; a low-cost, non-invasive, portable optical brain imaging methodology. Dr. Girişken’s findings suggest that fNIRS can be effectively used for developing a neuro-physiologically informed, predictive model of purchasing behavior that is based on multivariate effects of activations in the frontopolar, dorso-medial, and dorso-lateral prefrontal cortex of the brain.